With focus on the development of renewable energy sources, significant research is being directed toward the production and conversion of algal biomass to energy products, including biodiesel and ethanol. While researchers have historically focused on planktonic algae systems for the production of algal biomass, CO2 recovery and biofuel production, multi-use Algal Turf Scrubber® systems may provide a better solution. By comparison, Algal Turf Scrubber® systems have documented higher algal productivity in comparison to open pond phytoplankton systems (NREL)1. More impressively, these higher algal productivity rates are achieved in commercial scale systems that are designed to provide nitrogen and phosphorus treatment of impaired surface waters, a feature unique to the Algal Turf Scrubber®. 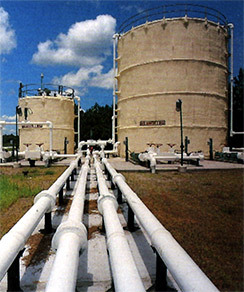 In the future, Algal Turf Scrubber® treatment systems developed along nutrient-impaired surface waters like the Mississippi and Potomac Rivers offer the potential to recover tens of millions of pounds of excess nitrogen and phosphorus while producing biofuel as an end product. This will allow protection of critical natural resources like the Gulf of Mexico and Chesapeake Bay, while producing energy and creating jobs within local communities. In addition, these multi-use Algal Turf Scrubber® facilities will be well suited to reduce expected increases in nitrogen and phosphorus loads as corn acreage and fertilizer use grow to meet the rapidly expanding ethanol production industry. 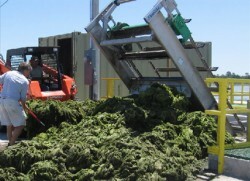 Algal biomass from the 15 MGD Taylor Creek Algal Turf Scrubber® Surface Water Treatment Facility was the subject of several biofuel research projects. Partnering with Midwest Research Institute (MRI) and the Center for Environmental Restoration (CER), these biofuel studies served as the foundation for the development of future biofuel production research. HydroMentia is currently partnering with Sandia National Laboratories investigating biofuel production potential from a Mobile Pilot Algal Turf Scrubber® system treating water near the Salton Sea in California. 1. J. Sheehan, T. Dunahay, J. Benemann, P. Roesler, 1998. A Look Back at the U.S. Department of Energy’s Aquatic Species Program—Biodiesel from Algae. National Renewable Energy Laboratory, Contract No. DE-AC36-83 CH10093.